Primary Possibilities: Transportation Home FREEBIE! My youngest son, Reed, has been sick recently. He is such a tough little guy, but needed mommy to be with him while he was sick. As I was going through sub plans, I realized I needed a more convenient way to track how my students go home. I have several students who ride a bus and many who either walk or go to after-school daycare. I decided to create a Transportation Home sheet that I could leave with a sub and feel confident that my students arrived home safely. Just click the picture below for a FREE download. I also stumbled on this wonderful FREEBIE for April workstations. 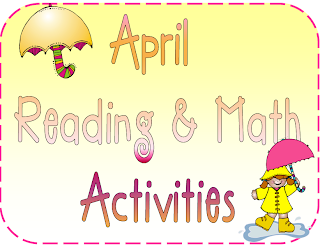 It is full of many math and reading activities for math workstations and literacy centers. Thanks for linking back to my freebie! I am so super jealous you went to Mexico! My hubby and I have gone for 3 years in a row but missed this year and took our kids to Disney World instead. That was a great trip also but I missed the lazy days on the beach!!! Thanks for your FREEBIE!! Our trip was a first time and we are now saving for Disney also! We would love to make Mexico an annual trip, but my husband and I have different spring breaks:( I think I too will miss those wonderful lazy days! !